Personal Injury Compensation: How Much is Your Case Worth? Your personal injury compensation is directly related to your past, present, and future medical bills. Certain other losses are also factored into the total, like out-of-pocket expenses and lost income. Calculating the total amount of your losses, or “damages,” is never easy. It often requires putting a price on things that don’t have a monetary value, like pain, suffering, and emotional distress. Your total demand amount certainly won’t match up with the insurance company’s offer. Your job is to get paid as much as you can, and theirs is to pay as little as they can. Still, you need to find a dollar value for your personal injury claim, and this section helps you do that. We’ll explore how attorneys and claims adjusters arrive at their settlement amounts, and how you can use a little know-how to boost that number. What Can You Claim for Personal Injury Compensation? You can get a higher settlement by knowing the different types of damages to include in your demand. Special and general damages directly impact the total amount you can seek for personal injury compensation. Winning a personal injury claim for pain and suffering can difficult. Insurance adjusters aren’t going to give you more money simply because you ask for it. You must learn how to properly calculate pain and suffering, and how you can legitimately increase the amount. Insurance claims adjusters have their own way of determining total damages. If you know how they evaluate things like pain and emotional distress, you can strengthen your negotiating position. This section looks at how certain factors raise or lower injury compensation. The types of injuries suffered and the circumstances surrounding those injuries can drastically influence your final settlement amount. Long term disabilities and permanent injuries have a huge impact on the amount of pain and suffering compensation. These cases are complex, and should only be handled by an experienced personal injury attorney. Emotional distress is another big factor to consider in your personal injury claim. Working this type of suffering into your claim, and proving it, isn’t always easy. But psychological symptoms can be just as real as physical symptoms, and they deserve to be compensated. In addition to direct damages like medical bills and out-of-pocket expenses, lost employment income should be added to your demand for compensation. This section shows how to include past and future earnings in your personal injury settlement. 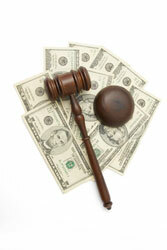 Personal injury damages don’t always get paid in full. There are several factors which can decrease your final payout. Learn how these factors affect your settlement so you can address them when negotiating with the adjuster. If your personal property was damaged due to someone else’s negligence, regardless of whether you were injured or not, you may be able to file a property damage claim for compensation. Saying the right thing and using the proper medical terminology can prompt the insurance adjuster to offer more money. Here we’ll look at some of the things you should and shouldn’t stress in order to get a better payoff. There are certain tactics you can use when negotiating with the adjuster to increase your personal injury settlement. History of jury verdicts and the insured’s driving records are two influential factors that can help in your negotiations. If all else fails and your claim is denied, you may have to resort to a personal injury lawsuit, or at least the threat of one. Here we teach you a few negotiation strategies to get at least some compensation from the adjuster, even if she at first denies your claim. Why do I have to use my own medical auto insurance policy? Lawyers receive more than five times my compensation? What would be a fair multiplier? Insurance denying lost wages and pain and suffering, but paying medical bills? Current valuation method for pain and suffering settlement in Texas? While I was at local grocery store, a candle display fell on my second toe on my right foot. Blood shot out under my toenail…. Is the mileage expense of driving to medical appointments reimbursable? Do I List the Actual Medical Costs or Out of Pocket Medical Costs in my Demand Letter? When must the bank release my settlement funds? Auto Accident Settlement Without Medical Bills? I was in an auto accident where I got rear ended and the other driver’s insurance admitted fault. I am claiming that I got hurt…. Injury settlement doesn’t pay medical bills? How much should I counter offer for this car accident settlement? Are Medical Bills and Pain and Suffering Paid Together?